Without developers, timelack and hustle. Via robust data import wizard. It takes you no longer than 20 minutes to set up the import to CHERWELL SOFTWARE and run the test data transfer. We do not disclose any of your information with third parties, and moreover thoroughly protect it, so nothing gets lost or stolen. 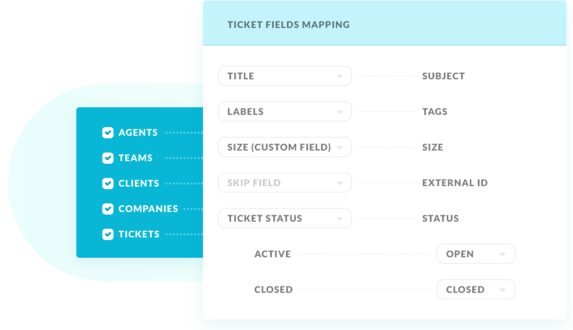 Only Help Desk Migration lets you instantly transfer custom fields, as well as map their destination. All tickets will be imported to CHERWELL SOFTWARE with their corresponding agents, contacts, and attachments, that way, saving the history of customers' requests. Select and connect your source service desk with HDM. Grant the right to access your CHERWELL SOFTWARE account. We shall investigate your case and send you with a price range and a scope of tasks. We consider security very seriously and have developed an in-depth set of practices , technologies , and policies to help ensure your data is secure.